What a gorgeous day it was today! All other plans went out the window when the bees began to fly. I am not sure where my bees are foraging, but there is most definitely fresh nectar and pollen coming in. I took the opportunity to center a few of the hives whose most recent mite board reading showed the cluster to be far to one side of the hive, giving the colony more feeding options as they cluster in cold weather. 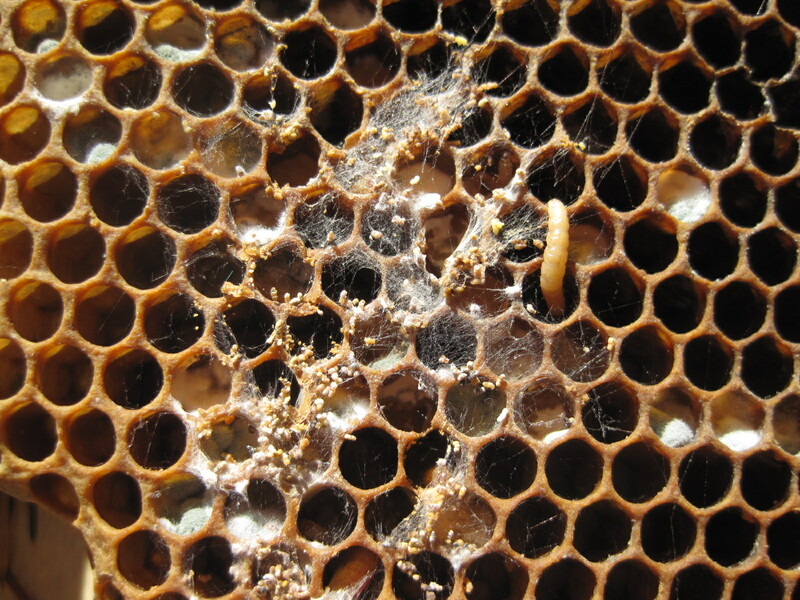 These wax moth larvae were slinking around in an untended corner of a fairly populous hive. While they wouldn’t have been likely to cause this strong colony a serious problem, I was still happy to take this frame out now. Two days in the freezer will kill the moth larvae and allow the safe storage of the frame. Any ideas about what might be blooming with bright yellow and light brown pollen this time of year?